The Buffalo Creek Recreational Trail in Clay County uses an inactive railway as a tourist attraction that currently offers jitney rides and rail biking with pedal cars up to 6 miles one direction — punctuated by a completely unexpected 70-foot natural waterfall. That’s what is happening in Clay County. The U.S. Census Bureau estimates the population at roughly 8,700 people, and many passing by on Interstate 79 on the county’s northern tip or on Route 19 east of the county may not be aware of what’s there. Like many areas in West Virginia, it could appear to be just a blip on the map when driving through to other areas. However, Mike Shamblin, a WVU Extension Service agriculture and natural resources agent in Clay County, also works closely with the Clay County Business Development Authority and other community groups as a thread that bonds them all together to work for the greater good. He puts in a lot of time outside of work volunteering with these groups. When asked why, the answer was simple. One such project is the Buffalo Creek Recreational Trail. It uses an inactive railway that runs along Buffalo Creek as a tourist attraction that currently offers jitney rides and rail biking with pedal cars up to 6 miles one direction — punctuated by a completely unexpected 70-foot natural waterfall. 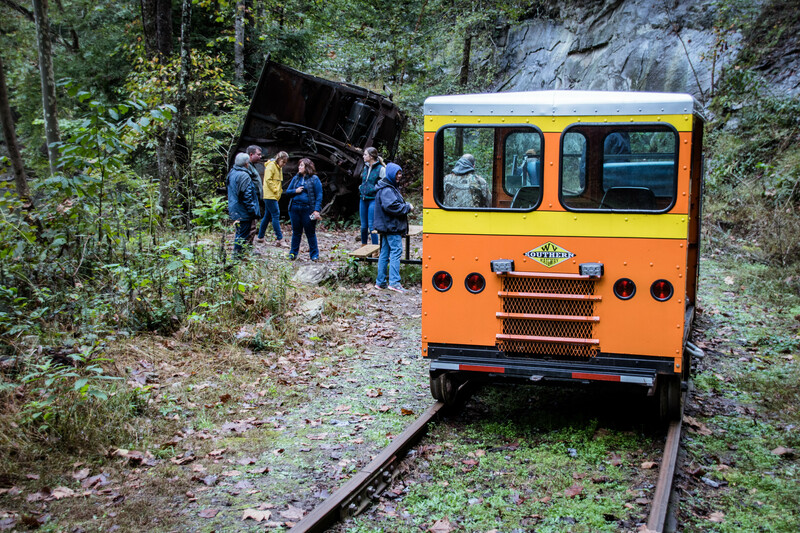 Along the way, there are stops that teach riders about the history and ecology of the area, including natural cliff overhangs that serve as bat caves and an overturned railcar from a wreck on the Buffalo Creek and Gauley Railroad in the early 1980s. Other small waterfalls and railroad artifacts dot the ride up and back. It’s unique in the fact that it’s one of only three operations in the nation to offer rail biking. 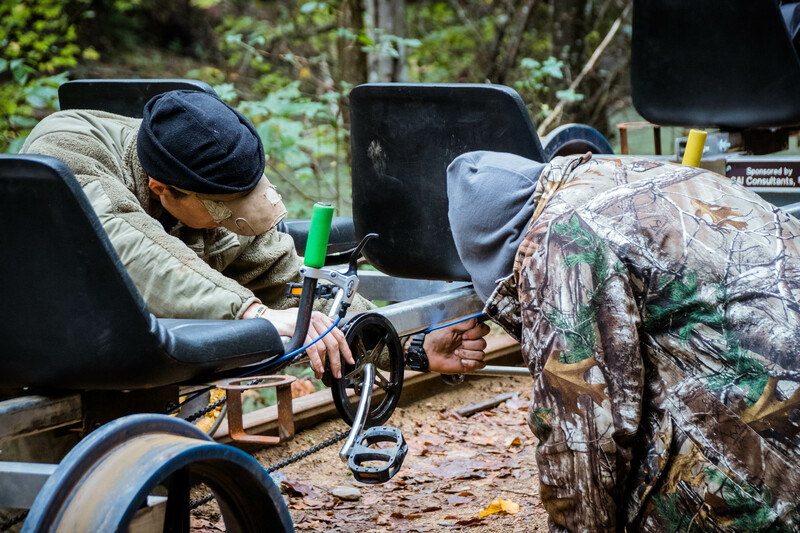 It’s also unique in the fact that it can be adapted to whatever level of physical activity riders want — the jitney can tow passengers up and back, passengers can pedal one direction or for the full challenge, passengers can pedal the whole way up and back. The Buffalo Creek Watershed initially developed the trail system, and Shamblin helped coordinate Clay County 4-H’ers who wanted to volunteer to help with the project. They rebuilt four bridges, cleaned up along the creek and mapped and staked the trail with mile markers. As of fall 2018, the Buffalo Creek Recreation Trail went through a soft opening for riders and it became a hit. A few thousand riders from the majority of the United States and a few from other countries raved about the experience, and weekend rides were often booked solid. As they currently set their sights on being officially open for business, Shamblin sees it as a tremendous opportunity for Clay County as a whole. The Buffalo Creek Recreation Trail is looking to start the rail rides in mid-April (weather permitting) and hopes to see a consistent stream of riders come to the area and enjoy everything Clay County has to offer. Reservations are recommended, and you can keep up with their happenings on their Facebook page and website. The venture is one example of moving West Virginia forward. The more the state can leverage untapped opportunities like the Buffalo Creek Recreational Trial, which bolsters recreational, tourism and lifestyle assets, the more prosperity local economies can advance overall economic prosperity. West Virginia Forward is a statewide collaboration led by West Virginia University, the state Department of Commerce and Marshall University to help grow the economy by adding jobs, investing in education and improving health and wellness to create the most prosperous West Virginia possible. An old railroad wreckage site is one of the stops on the Buffalo Creek Recreational Trail. Keeping the jitney in good repair.